What am I reading and dreaming of the beach….. Sometimes I like to share with you what I’m reading. Often times its more then one book. I honestly, don’t know why I do this to myself. I think its because when I get a new book, I like to start reading it right away, even if I have another book going. I just can’t leave that first page unturned. Key Word Study Bible with Hebrew-Greek dictionary in the back and word study tools. I was using a parallel bible with King James Version and Amplified but I was always being called back to my Key Word, this is one great bible. I returned home to it this last weekend. Girls With Swords by Lisa Bevere Couldn’t resist the title. “If you don’t have a sword, sell your cloak and buy one!” ~Jesus (Luke 22:36) You have a right to keep and bear arms, it says so in the constitution. You also have been given a weapon that is mightier then any gun that could ever be owned. The Word of God is something we are more comfortable studying then wielding. The word of God, it is a weapon, learn to use it! Late, Lost and Unprepared by Cooper-Kahn & Dietzel This is a parents guide to helping children with Executive Functioning. Ya know the part of the brain that controls everything essential to being successful in ‘doing’ life, like planning, organization, self-monitoring, impulse control, working memory, and initiating tasks. This book is not for the faint of heart…if you have a child that has the challenge of ADHD, Autism, Learning disability or just simply struggles with school for no specific reason…get the book. I’ve become my own little scholar in this world called brain development and frontal lobe deficiency, it serves a purpose. 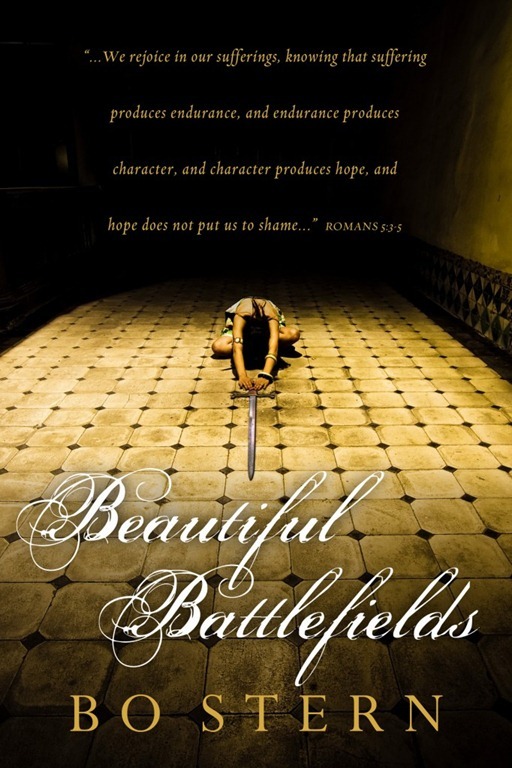 Beautiful Battlefields by Bo Stern I’ve already read this book. It came to me one day and I read the last page the next. The author is dear to my heart. I know her and I’ve watched her family and I pray for them daily in a continual sort of way. Bo Stern is a warrior, she tells her story of the battlefield of ALS(Lou Gehrig’s disease) but she also tells the story of every kind of battle you can list. I read my story between the pages and it touched home. If you or someone you know is struggling with a giant in their life, get the book. It will give you a battle plan and courage to be strong and take hope! Pursuing Justice by Ken Wytsma This is the only book I’m currently reading on my iPad. I usually like to turn the actual pages but in this case I wanted the book now and so I downloaded it. The author is a pastor at a local church here in Bend. We decided to stop by last weekend to see if it might be a place we can call home, it might be…I’ll keep you posted. Finding a community of believers that you can connect to and a church body you can really call family is a difficult task. But I digress….I’m a Justice Girl. I was born with that inner drive to seek justice for all (kinda like a super hero), my son picked up that same part of DNA from me. I’m sure you’ll be hearing more about what this book is doing to me in the next couple months…big things I tell ya, big…. 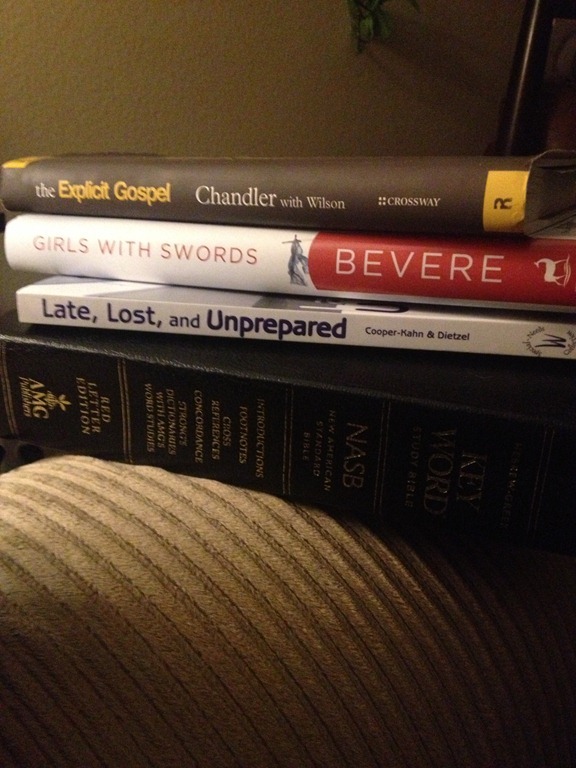 That’s it, that’s what’s on my reading stack…I don’t have a shelf. I just keep my books stacked next to my study area and read as I go. When is there time to read anymore? During swim practice, while dinner is being cooked, between phone calls, as you wait for the kids to get out of school, before you turn the light off at night or jump in the shower in the morning or while laying on the beaches of Hawaii….since I don’t have Hawaii, I resort to grappling my way through each page, any moment I can steal away!